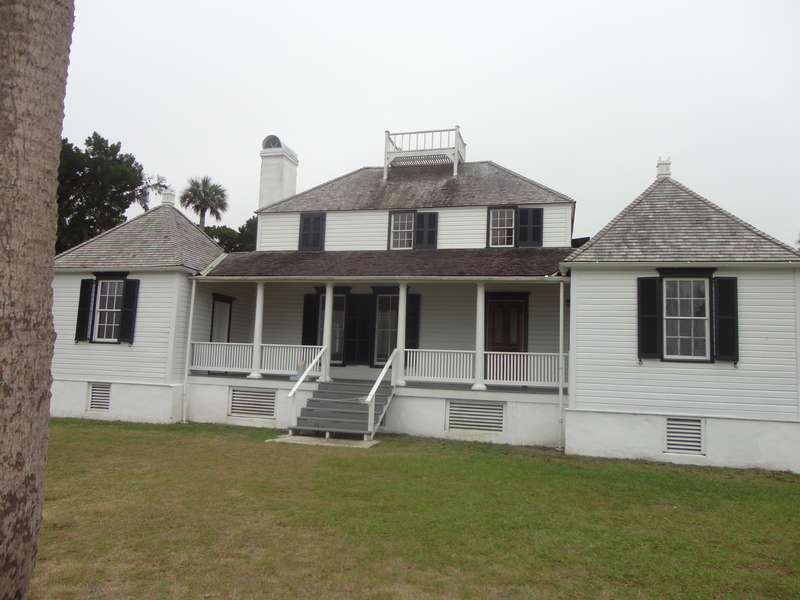 The Kingsley Plantation is filled with a unique perspective of plantation history. We hear about slavery and plantation life in many plantation visits, but this was the first plantation I have ever been to where a slave became a land owner and a family while not rallying against slavery, tried to encourage better treatment of free and enslaved blacks. The story of Anna Kingsley begins when Anna Madgigine Jai, born in Senegal was taken into captivity and sold in a slave market in Havana, Cuba to Zephaniah Kingsley. After purchasing her as a slave, Kingsley later married her and together they would have four children. The story of her business sadly lasted only months when an attack came from American forces who tried to wrest East Florida from the Spanish. In an effort to flee, Anna lit a fire that consumed her house and property as she escaped with her children and slaves on a Spanish gunboat. The Spanish government then compensated her for her loyalty with a land grant of 350 acres. During the American advance both Anna’s property and Laurel Grove were destroyed so in 1814 Zephaniah and Anna Kingsley, along with their children and slaves, moved to Fort George Island. This is a sea island that can be toured today. My friend Rose and I visited the plantation. The island is located near the mouth of the St. Johns River and to get there, we took a ferry to the island and enjoyed our visit. During this time, Kingsley’s Florida landholdings increased to 32,000 acres included timberland, orange groves, and four major plantations with a workforce of 200 slaves. The holdings produced Sea Island cotton, rice, and provisions. Like many plantation owners in Florida at that time, Kingsley owned ships which he captained on trading voyages. When traveling, Anna ran the plantation. Everything changed for the Kingsleys when the US bought Florida from Spain in 1821 and enacted strict conditions for Florida’s black population. Zephaniah Kinsley fought against the policies and in 1828, published his opinions in A Treatise on The Patriarchal, or Co-operative System of Society As It Exists in Some Governments . . . Under the Name of Slavery. Roads and bridges were built and the Kingsleys planned a school for the community and started a new colony in 1837. In 1839, the Fort George Island was sold to his nephew Kingsley Beatty Gibbs after great dispute from Kingsley’s relatives. During the Civil War Anna lived in Union-occupied Fernandina until the end of the conflict. In 1865 Anna Kingsley returned to the St. Johns River and she passed away in 1870. The plantation and Fort George Island is a place of an amazing story and history that shouldn’t be missed. Log onto http://www.nps.gov/timu/historyculture/kp.htm for more information about this fascinating place.